Welcome to The Tiki Lounge Tiki Culture Tiki Blog! It’s a swingin’ Tiki bar on the web, the “Blounge”, or web-lounge for Tikiphiles, retro hipsters and anyone who digs cocktails, jazz, big-finned cars and classic music standards from a cooler, swanker time. 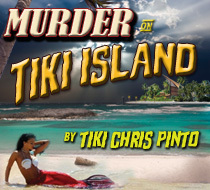 About Tiki Bar Talk and Tiki Chris Pinto, aka “Mack”, editor/author/bartender. Welcome to Tiki Lounge Talk, the hep-and-hip paradise for conversations at the Tiki Bar. 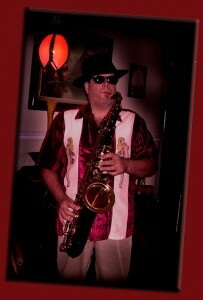 Whether it’s kool cars, Tiki bars or movie stars, we pretty much rap about anything and everything, with a retro twist. My goal is to make this site the world’s number one spot to visit for kats and chicks who get their kicks diggin’ the retro scene, love Tiki Culture, and live every day like it’s somewhere between 1928 and 1963, give or take a decade or two. So if you’re hip (or hep) to the retro lifestyle, Tiki lifestyle or just like to read some kool stories, dig in, kids. You’ve arrived. Here you’ll find posts from vintage movies (Mod/Noir/Retro Movie Mondays) to exotic Tiki bar cocktail recipes. I rap about the things I love…classic cars, Exotica, jazz & big band music, (Sinatra, Dean, Goodman, Shaw, Butera, Martin Denny, Elvis and Setzer to name a few), Scotch, Rum, in fact anything behind the bar (except Campari. Ick. ), Tiki artists, events, pin-ups…aw hell, just about anything from the past that’s worth bringing into the future. This site is for everyone into Tiki Culture and the Retro Scene. I don’t discriminate if you like to listen to Jimmy Buffet at your Tiki Bar. There are some swingin’ Tiki Bars in the Florida Keys that play lots of Buffet and people love it. I don’t care if your Moai masks are made of plastic and come from Party City, or if you have authentic, 200-year old Tikis in your bathroom, it’s all right by me. All I ask is that you enjoy your cocktail, whether it’s a Mai Tai or a Manhattan, and stay in the groove. About me, Tiki Chris P: I’ve officially been on the internet since I opened an AOL account in 1991. Back then, AOL was mainly for Mac users, and cost $4.95 a month plus overage. Once I got a bill for $400 because someone hacked my password. I of course didn’t pay it. So I’ve been linked in for a long time, but I just recently…and I mean in the two years or so…got the idea in my head to learn web design, start a blog, and toss my hat into the ring. The internet has something for everyone, so maybe someone will be interested in what I have to say here. My hobbies include living the good life (with as much retro fun stuff as possible) with my pretty, pin-uppy model wife Colleen in South Florida, gazing at palm trees, playing jazz sax & clarinet, theater, writing, working on my ’53 Chevy Belair hot rod, and looking at pretty women (yes, my wife included). I’ve written 12 plays, many of them produced in my theater company back in the ’90s around Atlantic City. I have published my first novel online, “Murder Behind the Closet Door”, a noir-style mystery wrapped up in a spooky ghost story. I’m hoping to drum up some interest in it, and maybe get a shot at having it fully published some day (I know it’s not easy to do, but I at least have to try.) You can visit the MBTCD website or Facebook fan page to find out more info or order the 600-page paperback ($16.95 at Amazon.com) or the eBook version for Kindle, iPad, etc. for $3.95. The first website I created is dedicated to my lifelong pal, my 1953 Chevy Belair Stardust, a car I’ve owned since I was 21. (www.53chevyhotrod.com) My second is dedicated to Star Dust Productions, the theater company my wife Colleen and I had back in the ’90s. (www.stardustmysteries.com). 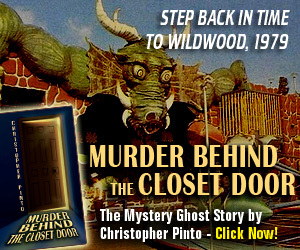 The third is the site for the book, Murder Behind the Closet Door. This blog is dedicated to all the fun stuff I’ve enjoyed, and continue to enjoy…in the hopes that others might find a little bit of fun in this wacky Tiki rum-filled world too! 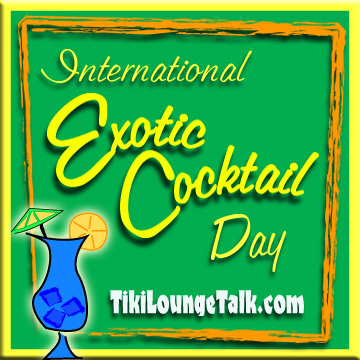 So sit back enjoy a little Tiki talk, some swingin’ music, a couple of fun drink recipes and some kool writing, here at Pirate’s Cove Tiki Bar, where the drinks are free and the bar is open 24 hours a day, 365 a year. The necessary disclaimer: Please note, this site assumes you are not a complete idiot and will not do something stupid like make a 5-liquor drink, guzzle four of them down, and go driving in your vintage convertible. Don’t do that. All of the content on this site is copyrighted so if you steal it, you’re not only a jerk, you could be sued. I assume no liability for anything you do in your life, including anything connected to this site. As this is a fun, opinion blogsite that is written on the fly, we take no responsibility for any inaccurate information, and especially take no responsibility for damages of any kind that may arise in any way associated with this site, including but not limited to loosing a bet about what kind of rum is in a Mai Tai. Read at your own risk, bub. Tags: Tiki Culture, Tiki Lifestyle, Tiki Blog, Retro Living, Retro Scene, Vintage, classic cars, Retro Lifestyle, pin-up, Tiki Chris, Christopher Pinto, Murder Behind the Closet Door, Murder on Tiki Island.